As a food writer, I'm occasionally sent products for review. I'm happy to try them out, but it's rare that I find a product to be so exceptional that I'm willing to fork over valuable real estate to write about it. In fact, all this year I only reviewed two products: chocolates from Jean-Philippe Patisserie (in the Belagio, Las Vegas) and Fever Tree's new Ginger Beer. Donsuemor French Almond Cakes: Last year I wrote a review about Donsuemor's Madeleines, which were sinfully delish--as good as any madeleine I've ever had in France, and better than many. So earlier this year, when I received these French Almond Cakes, I approached them with a bit of skepticism. How could they possibly improve on the madeleines? And, in fact, they don't actually improve on the madeleines; but they're not supposed to. These petite and elegant cakes head in a different direction, one that's equally luscious. They have a more "cakey" mouth presence, while being moist and light and almond-ish. I savored them slowly, one a day, always with a glass of milk. They are just heavenly. Donsuemor does a fabulous job with their packaged delights; they really do seem to be bakery-fresh. I continue to be really impressed with this company. For more info and to buy a supply of your own, visit Donsuemor's website. 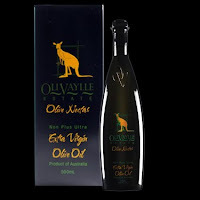 OliVaylle Extra Virgin Olive Nectar: An Australian company, OliVaylle unabashedly describes this ultra-premium product as "the finest extra virgin olive oil in the world." It just might be! I have treasured every drop of this taste-explosion, saving it for simple salads where the nectar's slightly biting taste can rule in all its glory. Australian olive oil imports are something new, but at one time the importation of Australian wine was new, too--and just look at what's happened with that. Australia's climate is similar to other wine- and olive-producing regions in the world: California, Italy, France, etc. So, really, it should come as no surprise that Australia can turn out a fabulous olive oil. OliVaylle was founded in 1997 by Jorge de Moya with the express intent of producing the world's best olive oil. Moya's family-owned olive plantation and olive oil producing facility are both located in Victoria. Why do they call it nectar? 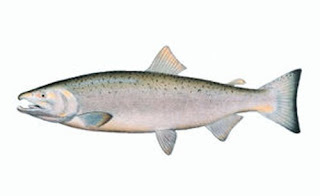 Simple: in classical mythology, nectar is considered the life-giving drink of the gods. Visit the Olivaylle site, where you'll find lots of info and recipes for an Australian Family Dinner, a Cuban Fiesta, an Italian Date Night, a South African Fusion meal, and an evening of American Entertaining Elegance. You can also order Olivaylle's olive oil nectar in the site's shop. Pop those corks tomorrow night, readers, and here's to a great 2010! Over the Holidays I finally had a chance to watch Bottle Shock. 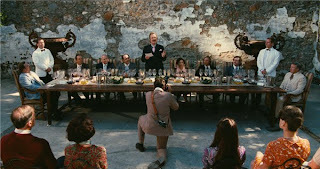 This somewhat fictionalized 2008 movie recounts the stunning wine competition of 1976 that has come to be known as The Judgment of Paris. This blind tasting pitted then-upstart California wines (mostly from Napa Valley) against “unassailable” French wines such as Mouton Rothschild and Puligny Montrachet. To the shock of everyone involved, California's wines won easily in both white and red categories. 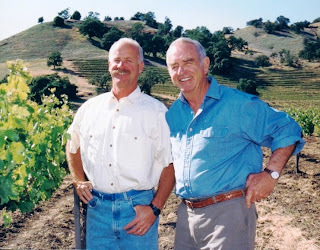 At that moment, California wines stepped from obscurity and onto the world stage, where they have not only remained---but ruled. 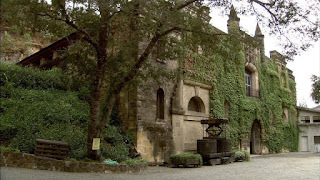 We don’t really hear about Stag’s Leap Wine Cellars in Bottle Shock, which focuses on Napa’s Chateau Montelena and its owner, as well as on the tasting’s organizer. 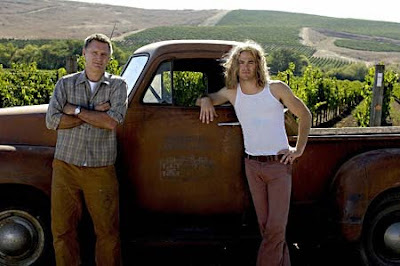 Jim Barrett, played by Bill Pullman, owns the winery; he’s assisted, sort of, by his hippie son, Bo Barrett (Chris Pine). 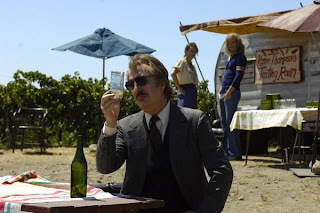 Alan Rickman plays Steven Spurrier, the British wine shop owner who lived in Paris and organized the event. There was plenty enough in the actual events to provide lots of interest and dramatic tension, but for some reason the movie makers threw in a couple of side plots. Bo Barrett’s romance with a beautiful winery intern really didn’t add much (I’ve no idea if it was fictional or true, and don’t care). The other side plot was better: a real-life winery worker at Chateau Montelena named Gustavo Brambilia (Freddy Rodriguez) added color and depth to the Napa Valley story. However, after doing a little research today, I learned that Brambilia didn’t join the winery until after all these events had occurred. So even though he himself is not fictional, his actions in the movie were. Today Brambilia is in partnership with Thrace Bromberger in the Napa Valley winery, Gustavo Thrace. But the above paragraph is a mere quibble. If you’re at all interested in California wine, you’ll enjoy Bottle Shock. It's not brilliant, but it's amiable and fun. 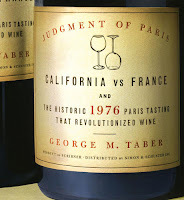 The Judgment of Paris is big and important history in the wine world, so it’s worth knowing about. And the Napa scenery is gorgeous--almost as good as driving through it yourself. Also, one of my favorite-ever wine movie moments is in this movie. Alan Rickman, as Spurrier, travels all over Napa Valley, sampling wine to come up with the best selections for the blind tasting. You see him in hotel rooms, sitting on farm porches or in restaurants, always sniffing and tasting. In my fave scene he’s sitting at a small table outside, on a hill, with vineyards all around him and fading into the distance. He’s gazing at a glass of red wine in his hand. The humble-looking winemaker walks to the table and places a small bowl of Guacamole and another bowl of chips on the table. Rickman, the proper Brit with French appetites, gazes curiously at the bowls and then takes a chance, scooping the guacamole onto the chip and into his mouth. It tastes good…he thinks, though he’s not quite sure. Then he lifts his glass and takes a sip. Rickman’s face lights up. It is the perfect pairing of moment, food and wine. If you have ever had a moment like that, and I hope you’ve had many, you will know exactly how he feels. From Publisher's Weekly: In 1976, a Paris wine shop arranged a tasting as a gimmick to introduce some California wines; the judges, of course, were all French and militantly chauvinistic. Only one journalist bothered to attend, a Time correspondent, looking for a possible American angle. The story he got turned out to be a sensation. In both red and white blind tastings, an American wine won handily: a 1973 Stag's Leap cabernet and a 1973 Chateau Montelena chardonnay. When the story was published the following week, it stunned both the complacent French and fledgling American wine industries—and things have never been the same since. Taber, the Time man, has fashioned an entertaining, informative book around this event. Following a brisk history of the French-dominated European wine trade with a more detailed look at the less familiar American effort, he focuses on the two winning wineries, both of which provide him with lively tales of colorful amateurs and immigrants making good, partly through willingness to experiment with new techniques. While the outrage of some of the judges is funny, this is a serious business book, too, sure to be required reading for American vintners and oenophiles. Photos. Starchefs, a website devoted to professional chefs, has begun an interesting new series of articles devoted to the nation's "Mythic Kitchens." The articles will explore historic eras in famous kitchens---times when the stars lined up just right to combine the kind of food and chefs that helped build the definition of American cuisine. First up in the series is an article by Heather Sperling that examines New York City's Le Cirque under Chef Daniel Boulud (whose legendary years at Le Cirque were 1986-1992). Below you'll find the first two paragraphs, and you can continue reading here. It’s 8:30pm, and kitchen of Le Cirque is working at a frenetic, feverish pace. The pre-theater crush has passed, the tourists are midway through their meals, and the crème de la New York crème have just settled into their coveted 8pm seats. Owner Sirio Maccioni strides into the kitchen: “Chef! I forgot to tell you that Paul Bocuse and Roger Verge are here, and the King of Spain is going to be 12 people, not eight.” Daniel Boulud nods tersely. As soon as Maccioni disappears back onto the dining room floor, the chef begins tearing through boxes of produce picked up at the market that morning. Truffles, foie gras, and Tuscan lardo di Colonnata, smuggled into the country after Maccioni’s last trip to Italy, are gathered and lie ready to be spun into special courses for the VIPs. As the kitchen buzzes around him, cooking for the nearly 100 other guests, Boulud puts down his head and begins to create. It’s 1989, and it’s just another night at Le Cirque. The Culinary Gadabout Recommends: Want to cook like Daniel Boulud? A good place to start is with Daniel Boulud's Cafe Boulud Cookbook: French-American Recipes for the Home Cook. Says Publisher's Weekly: "Echoing the French-American accent of food from his casual Café Boulud, the New York City chef also acclaimed for Restaurant Daniel encourages home cooks to prepare meals as he does, by attending to four inspirations: his own French tradition, seasonal foodstuffs, international flavors and the kitchen garden."